Kurrajong Heights is a beautiful village on the outskirts of Sydney. Explorers and travel writers have extolled its panoramic views over the Hawkesbury valley and beyond for two centuries, while behind it sits the magnificent wilderness of the Blue Mountains National Park. The landmark of the village, both then and now, is the Lochiel House complex, the oldest building on the Heights, and built by its first settler, Joseph Douglass and his wife Mary Orr Burgess. After a convict beginning Joseph became a respected member of the community. 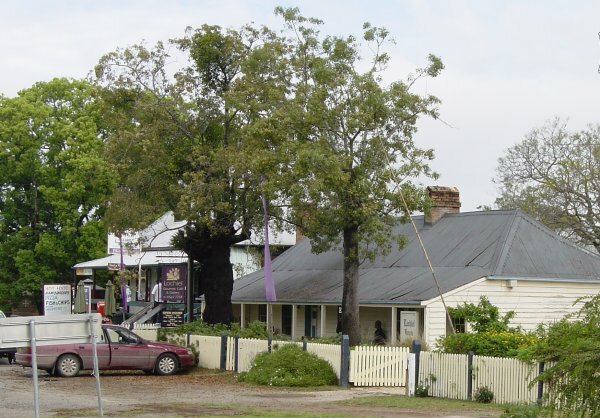 Douglass descendants still live in the Kurrajong district today, and Ivy Lodge, the Douglass home and now called Lochiel House, provides hospitality to visitors of the 21st century as did Joseph and his family 180 years ago. When questioned, Joseph denied any knowledge of the watch, and when confronted with the two pieces of cloth which were in his pillow slip, he stated he had purchased them from Berwick's clerk, being one piece for his seven-year-old child and the other for his child of four. Why did he do it? It is difficult from this distance to understand why Joseph, a family man and reportedly a strict Presbyterian, would risk the disgrace and misery of conviction and transportation for a silver watch and a few yards of cloth. Although no doubt poor, he had work and a roof over his head. Perhaps he was just tired of being so poor, and on the spur of the moment, in the crowded market town, he thought he could get away with it. But a distinctive silver watch would be difficult to sell, and the crime does not seem well thought out, nor his defence convincing. Joseph and his wife Mary Orr Burgess had lived in Scotland for about seven years, but they were born and married in County Down, Ireland,3 probably around the Saintfield/Comber/Killaney area where the surnames are found at that time.4 Douglass, Orr and Burgess are Scottish names and their ancestors possibly moved from the Scottish lowlands to County Down in the 16th century along with other Scots immigrants. We don't know if the Douglass or Burgess families were involved in the rebellion or on what side their sympathies lay. Some of the Presbyterian parishioners disagreed with the Reverend Birch's activities to the extent that in 1796 they broke away and formed their own church, the Second Saintfield Presbyterian Church. Nevertheless, the Presbyterians generally supported the rebels, in principle if not in deed. After the rebellion and the many reprises which followed, many people left the country. Perhaps the turmoil prompted Joseph and Mary to move to Scotland after their marriage, perhaps they wanted for some reason to return to their original homeland, or perhaps they were simply looking for work. It was common practice for workers to traverse the "Short Sea" (Donaghadee Ireland to Portpatrick Scotland) for seasonal work,6 but Joseph and Mary settled permanently in the heart of "Black Douglas country", the Dumfries district of Scotland, from about 1807. The family moved several times around the Dumfries farms. 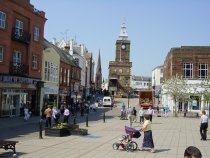 Joseph would have attended the annual (Whitsunday, 15 May) hiring fair in Dumfries, where employers contracted with labourers for a year's work, often, if married, in exchange for a cottage and small garden.7 This was where Robert Newell had hired Joseph in 1812. Five children were born at regular intervals between 1806 and 1814,8 before Joseph committed his felony and their world collapsed. Jamison had arrived only one year before Joseph, to take up land granted to his father, First Fleet surgeon's mate Thomas Jamison. 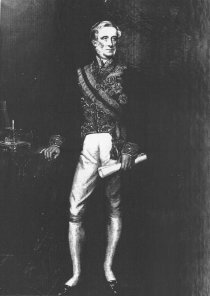 Sir John, a native of County Antrim, Ireland, had himself been a surgeon in the Royal Navy, and had been knighted first by the King of Sweden and then by the Prince Regent for services to naval medicine.15 He had accompanied Governor Macquarie on his first journey across the Blue Mountains in June 1815 and it was possibly during that time that he solicited the governor for suitable workers. With his farming background in Ireland and Scotland, Joseph would have needed minimal training to adjust to Australian conditions. He was employed as a specialist plough and seedman19 and was soon saving his wages for the day when he could set up on his own land, with his wife and family joining him. Although the situation described by Bigge may have been prevalent, it was unlikely to be the case on Regentville. Jamison, although a hard businessman, was known for the improved state of his land. He was president of the agricultural society and actively promoted the best practices. Unfortunately for Joseph, his choice of land was right in the heart of Macarthur country, where John Macarthur had been breeding his famous merinos. Macarthur's wool had just brought record prices at the London sales, on the back of which the Macarthur family were lobbying successfully in London and Sydney to have the rest of the Cowpastures granted to them. This was no place for a lowly ex-convict, especially one recommended by Macarthur's enemy, the liberal John Jamison.29 Joseph's petition was unanswered. 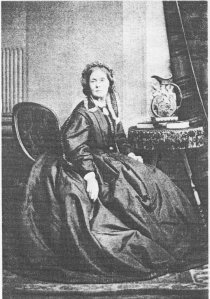 Meanwhile, Mary Douglass and her children, at Mr Morrison's in Saintfield County Down,30 were anxious to travel to New South Wales, but there was no ship! Convict families, including boys under 14 years, were given passage in female convict transports, being accommodated with the convicts. 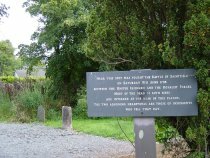 Governor Macquarie's letter about the Douglass family whereabouts had arrived in London in December 181931 and details were sent to Dublin in March 1820.32 But the next female transport from Ireland, the John Bull, did not leave until June 1821, and although at least 22 convict relatives were on board, the Douglasses were not amongst them. At least one approved family for the John Bull, Isabella O'Neill and her five children, missed the sailing because the naval agent at Cork gave her insufficient notice to travel,33 and Mary may have had the same problem. Altogether 44 family members presented themselves, and some were off-loaded. The ship finally sailed 26 January 1823 with 97 convicts, three short of complement, and 38 free women and children.39 After an uncomfortable voyage, during which three of the convict women died, the Woodman arrived in Sydney with the Douglass family all alive and well, to a relieved Joseph, on 25 June 1823. But where to select! 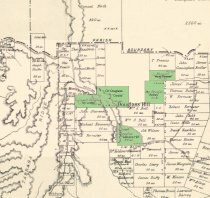 There was no land remaining in County Cumberland,46 and if the farm was to be viable it must be close to markets, so Bathurst and places across the Blue Mountains were out of the question. Joseph and Orr settled beside Bell's Line of Road, and by 1828 had cleared and cultivated 14 of Joseph's 50 acres and had 12 cattle.49 By August 1829 when surveyor James Byrne Richards arrived to measure the local farms, Joseph reported he had felled 30 acres and erected a dwelling house and a barn, at an expense of "upwards of £300". Further, on Orr's grant, 10 acres had been cleared, half of which were under cultivation.50 By February 1830 Joseph had erected a six-foot paling fence on his newly-measured farm, had an orchard and garden, 16 horned cattle and 22 pigs and was requesting another grant.51 This industry is remarkable considering the rugged nature of the bush and the debilitating drought which ravaged the country from 1827 to 1829. James, too, sold his grant as soon as he had fulfilled his bond. But in possibly a pre-arranged deal, he sold to his father, and probably remained farming at Ardrey while his father's family was established at Ivy Lodge. Joseph bought one more block of land: 50 acres two doors down the Hill, from George Greyburn for £10 on 4 March 1833. This he named Gibbons Hill.59 Meanwhile, he was ready to take advantage of his position on the Bell's Line. Despite Surveyor Hoddle's promising description of the new route across the mountains, the road had not been developed, and all the money was being spent on improving the southern route via Emu Ford. But drovers were using Bell's Line to take their stock to the Sydney markets, and travellers were needing a place to rest and eat before the hazardous trip down the Cut Rock of Tabragar Ridge. Joseph went on to request a license to sell spirits free of license duty, there being no public house that side of the Hawkesbury river. He was supported by the three local magistrates (Samuel North, W Richardson and George Bowen), who thought "a public house in the Kurryjong would be a convenience to the public, and tend to lessen the illicit sale of spirits in that District". The Governor approved a license on payment of £10 for the first year but there is no record of Joseph actually obtaining a license or establishing a public house. Instead, it seems they were distilling and serving their own brandy. Mrs Felton Mathew,63 liked Mary's cooking but disliked her wine. 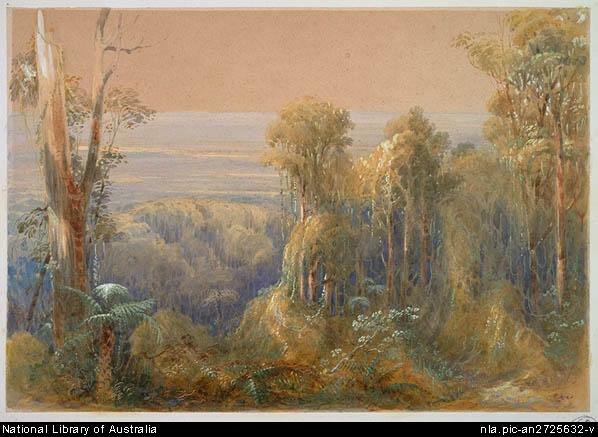 Tuesday 25th [March 1834] We drove up to the Kurrajong ...The Kurrajong district is an extensive mountainous tract, consisting of branches or spurs from the main range or Blue mountains, and abounds in picturesque and beautiful scenery. It is extremely fertile, and in many parts cultivation is carried to the summits of the mountains. It is of course thickly populated, but the settlers are of the lowest class, and among the most vicious and depraved in the whole colony: there has been a school lately established which in time may work some improvement, and the Chaplain of Windsor visits it occasionally, but there can be little good effected till there shall be a resident clergyman, and regular services performed. Jane, Lady Franklin,65 thought Mary's damper the best in the colony. Those early distinguished callers might not have stayed the night, but Ivy Lodge hosted many other guests, who visited both for the scenery and the recuperative powers of the climate. Joseph actually bought two blocks of his son's former grant, right opposite Ivy Lodge. But the largest purchasers were the Bowman family of Richmond, and over the years the village progressively became "Bowman territory". 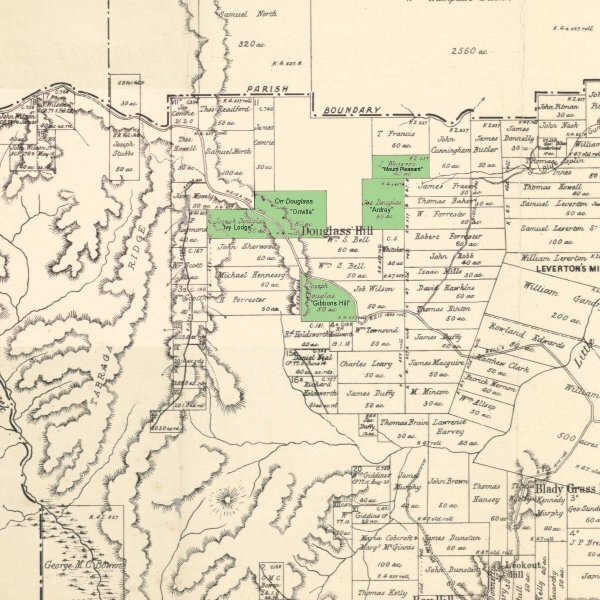 Samuel North was posted away from the district in 1844 and he leased his estate. At that time he had 40 acres of wheat, potatoes and maize, an orchard, a vineyard and a cottage.70 Charles Enderby of Bathurst took a seven-year lease at £25 per year from 1 January 1848, with an agreement to keep the tenement, barn, stable and out buildings in good repair, prune the trees and vines and not cut down growing timber except for domestic use.71 In 1856 North finally sold all his interests in Kurrajong to James Comrie, who became the next, popular "squire" of the district until his death in 1902. Mary Douglass died at Ivy Lodge on 21 December 1857, aged 75. Presbyterian minister James Cameron was apparently not available, and Mary was buried privately by her family, possibly on Joseph's plot of Orr's old grant opposite. 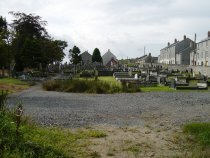 According to a travel writer in the Town and Country Journal of 1871, Joseph and Mary, "each aged four score years, lie interred in a little orange grove at the bottom of the hill, and opposite the house where they lived for many years".73 At some stage her remains were moved to the churchyard of St David's Presbyterian church on the Heights, and she now lies with her husband in the churchyard there. 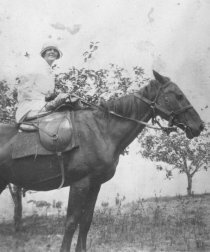 After Mary's death Joseph lived with his youngest daughter Sarah and her husband Cuthbert Cowling, while son John and his wife Ellen managed Ivy Lodge. Ellen was herself the daughter of innkeeper Michael Keenan, late of Keenan's inn at Hassans Walls and then at Jews Creek near Ben Bullen on the Mudgee road, and so was an ideal person to carry on the high reputation of Ivy Lodge. Cuthbert, sure that right was on his side, counter-sued in the Supreme Court for wrongful eviction. The bitter and costly case lasted about 12 months, and predictably, no-one won. Because Joseph had not registered the land transaction, the Court ruled that the land was his, but he must pay Cuthbert and Sarah compensation with interest for the improvements they had made over the 12 years of occupation. Cuthbert had mortgaged his other land to pay his legal fees and in 1863 when he couldn't meet his debts he had to sell it to Peter Hough.76 Joseph and son John had to mortgage Ivy Lodge to solicitor William Walker, and sold Gibbons Hill to Peter Hough's son-in-law, Arthur Powell.77 Powell continued the boarding house tradition at Gibbons Hill for many years. On 21 September 1865, at 83, Joseph died and was buried by the Rev James Cameron at Kurrajong. John and Ellen kept up the farm and boarding house, with Ellen managing the house while John was away droving.78 In about 1867 John extended the accommodation by building a cottage adjacent to Ivy Lodge.79 The cottage still stands today and has been used as a post office and cafe for many years. A pre-fabricated structure, oral history records that the building was shipped from England.80 It is certainly different from the vernacular style of Ivy Lodge and the other early buildings. Miss Nina Douglass on "Ragtime"
I knew the old man well, and had many an interesting chat with him about old times. I remember him telling me he came to the colony with the late Sir John Jamieson, and acted as overseer for him on an estate he owned near Penrith; and when he left Sir John's employ he came straight away on to the Big Hill and started farming for himself. He was a straight old fellow, and his wife a fine motherly old woman. Both were strict Presbyterians of the old school. I remember getting into serious trouble on one occasion. We had been speaking of Joshua commanding the sun and moon to stand still, and I made use of a remark which the old man thought to be bordering on scepticism. And was I not soundly rated! I began to think of the old poem I used to read at school about the border fights between the Percys and the Douglasses, and wondered if he might not be a descendant of the latter, so I sang low. George Bowman, the purchaser of Ivy Lodge, was the brother of William who had bought at the Northfield auction 27 years earlier. Both brothers were members of parliament and great benefactors in the district. George had been instrumental in building the Presbyterian church adjacent to Ivy Lodge in 1867, and when he purchased the Douglass property he possibly had the idea of using it in conjunction with the church.88 A travel writer in 1871 wrote that the house was to be let for a ladies' boarding school should a suitable tenant be found,89 but no such school was established. In 1875, George transferred the property to his daughters Eliza and Mary Ann and their husbands Rev James and Dr Andrew Cameron.90 Mary Ann and Andrew, both ill, lived in "Douglass cottage"91 and died in 1876. Reverend James and his wife appear to have retained the cottage as a manse and sanatarium for visiting clergy, while in "Douglass House" they installed overseer John Liedich, who also took on the role of postmaster.92 When the last Cameron owner, Rev James, died in 1905, both houses and the attached land were sold to the incumbent overseer and postmaster Thomas Walker,93 in whose family they remained until 1949. At some stage the old house was renamed Lochiel House after the homeland of the Cameron clan and its chief, Cameron of Lochiel. 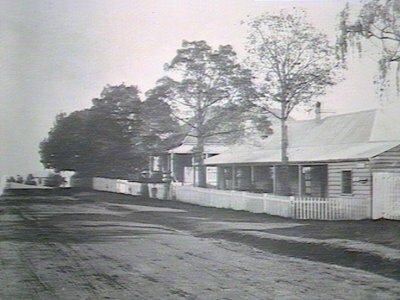 The old house and cottage still stand as landmarks at Kurrajong Heights, and an award-winning restaurant is housed within the original Ivy Lodge, thus keeping up the tradition of fine hospitality and good food started by Joseph and Mary Douglass in 1832. MacHaffie, Fraser G. The Short Sea Route. T. Stephenson & Sons Ltd, Prescott, Merseyside, 1975. Smout, TC. A History of the Scottish People 1560-1830. Collins, London, 1971. p.325. Scottish baptism records have been located for the middle three children. Bigge, JT. Report of the Commissioner of Inquiry into the State of the Colony of New South Wales British Parliamentary Papers. House of Commons 1822 (448) p.13-14. "Distribution of Convicts landed in New South Wales from January 1814 to 19 December 1820". Document A33 in Appendix to Commissioner Bigge's Report on Convicts. CO 201/118 p.168 (AJCP PRO 106). 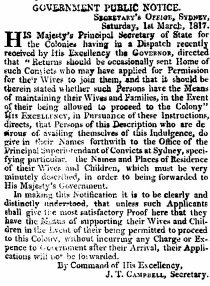 "Return of Men assigned to the undermentioned Individuals by His Excellency the Governor at Sydney from the 7th February 1814 to the 30th Oct 1819 exclusive of those assigned them by magistrates at various times at the out stations". Document A25 in Appendix to Commissioner Bigge's Report on Convicts. CO 201/118 p.129 (AJCP PRO 106). The other two assignees did not remain in Jamison's service, and presumably were unsatisfactory. Walsh, G.P. "Jamison Sir John (1776-1844)" in Australian Dictionary of Biography Vol 1 p.16. Fletcher, Brian: "Sir John Jamison in New South Wales 1814-1844" in Journal of the Royal Australian Historical Society Vol 65 Pt 1 June 1979 p.1. 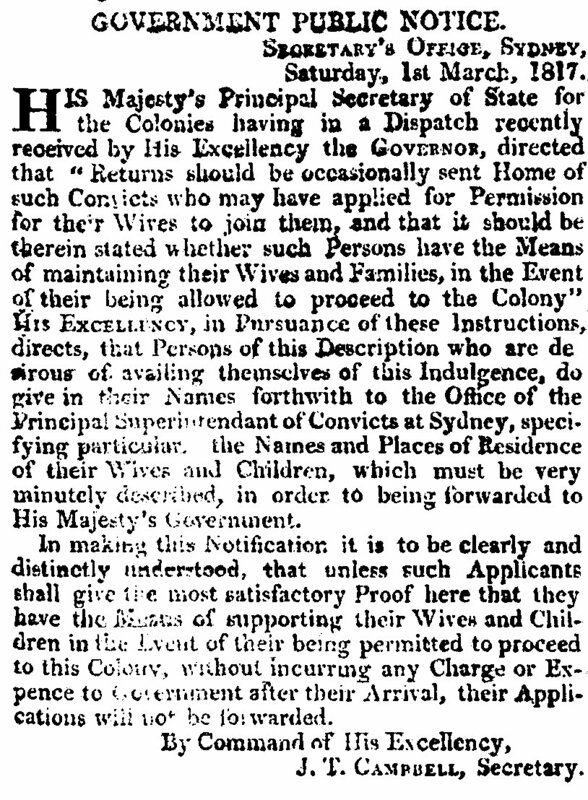 Government orders Sydney Gazette Sunday 15 Jan 1804 p.1 and Sydney Gazette Saturday 9 Jan 1813 p.1. Jamison's certification on Joseph Douglass' memorial of 8 October 1822. SRNSW: CGS 899, Memorials to the Governor, 1810-1826; [4/1829 No. 87]; Fiche 3044. Joseph's ploughing skills would have been acquired in Scotland, which was considered more advanced than Ireland in ploughing methods. See Handley, JE: The Irish in Scotland 1798-1845. Cork University Press, 1943. p.78. Macquarie to Bathurst 25 March 1819. The duplicate copy of this despatch No. 21, in the Mitchell Library, Sydney, (MSS 1192 p.203, reel CY518) includes the lists of 15 convicts and their families. Bigge JT: Op cit. p.120. SRNSW: Colonial Secretary; CGS 897, Main series of letters received, 1788-1826; [4/1780 p.257a], List of Government Servants in the employ of and supported by Sir John Jamison between the years 1814 and 1824, 31 Aug 1824; reel 6061. SRNSW: Colonial Secretary; CGS 899, Memorials to the Governor, 1810-1826; [4/1829 No. 87], Memorial dated 22 October 1822; Fiche 3044. 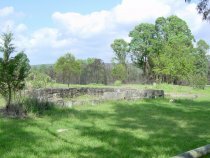 Peter Murdoch, superintendent of the Emu Plains convict farm and friend of Governor Brisbane, was granted 2000 acres along the western bank of the Mount Hunter rivulet, in the parish of Weromba, county of Camden. Ellis. MH: John Macarthur Angus & Robertson, Sydney. Famous Australian Lives edition, 1978. pp. 488-492. The tithe applotment records for the parish of Saintfield in 1835 show three occupants named Morrison: James (24 acres) and Joseph (6 acres) at Lisowen, and James (2 acres) at Carsonstown. National Archives of Ireland (NAI) CSORP 1822/T3187 of 1 Jul 1822. NAI CSORP 1822/T4116 of 24 Dec 1822. SRNSW: CGS 937: [4/3512 p.359], Reply, 10 Sep 1824; reel 6013. SRNSW: CGS 937; [4/3513 p.523], Reply, 2 Mar 1825; reel 6014. SRNSW: Colonial Secretary; [4/1814 p.97], Oxley to Cavenagh 26 Sep 1823; reel 6068. "... as for the County of Cumberland you can inform inquirers that no lands remain for settlers." Sainty, M.R. & Johnson, K.A. : Census of New South Wales - November 1828. Library of Australian History, North Sydney, 1980. SRNSW: Colonial Secretary; CGS 907, Letters from individuals re land, 1826-1856; [2/7844], Letter 29/6697 of 24 Aug 1829; reel 1120. See Appendix 1 for the surveyor's sketches. Portion 12, renamed portion 243. SRNSW: CGS 907, [2/7800], Michael Bergin; reel 1092. Ironically, Dr Bergin did not stay in Richmond, but by 1836 was at O'Connell Plains near Bathurst. See [2/7986], JJ Therry, reel 1188. He subsequently sold the Kurrajong grant on 10 January 1836 for £60 to Arthur Kemmis of Bathurst. See NSW Department of Lands, General Register of Deeds, Book O No 917. Portion 180, parish of Kurrajong. 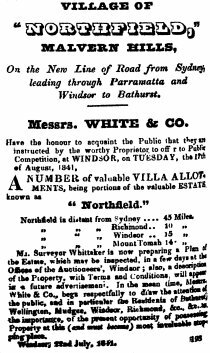 Notice in Sydney Herald Monday 3 February 1834. The 1841 census abstracts show Orr Douglass and family living at Wilberforce. When his daughter Mary Orr was baptised in September 1842 he was a sawyer residing at Homebush, Sydney. SRNSW: Colonial Secretary; CGS 914, Reports of the Commissioner of Claims 1835-1855; [2/1764], Case no 632; reel 1209-1226. 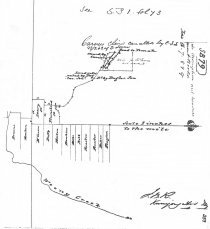 The name Gibbons Hill suggests his eldest daughter Mary Jane and her husband Matthew Gibbons may have lived there for a while. Alternatively, Gibbons Hill is a farm in Kirkcudbright Scotland not far from Airdrie, and may have had some association with the family. SRNSW: Colonial Secretary; CGS 905, Main series of letters received, 1826-1982. [4/2149], Letter 32/5726 of 25 May 1832. The New South Wales calendar and general post office directory , 1834 Stephens and Stokes, Sydney, 1835. Image provided by NLA, from Woodward, Frances J: Portrait of Jane; a life of Lady Franklin. London, Hodder and Stoughton, 1951. 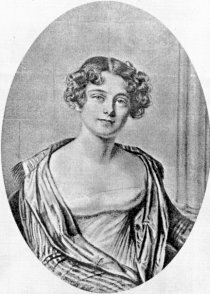 Diaries and letters of Lady Jane Franklin and letters of Sir John Franklin 1837-1859 27 June 1839. NLA MS114. Russell, Penny: This Errant Lady. 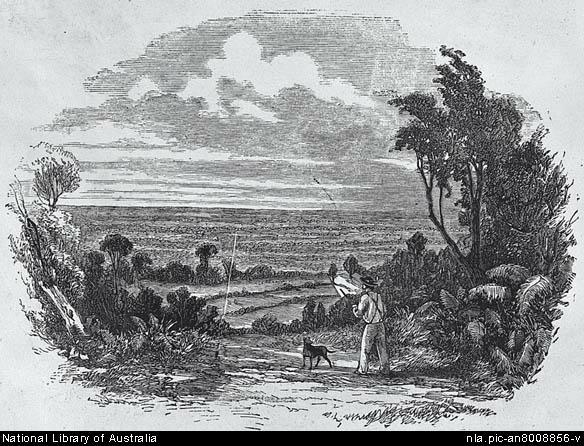 Jane Franklin's overland journey to Port Phillip and Sydney, 1839. NLA Canberra 2002. p.167. I disagree with Dr Russell's interpretation of Jane Franklin's description of Joseph's occupation as a scourger [flogger]. There is no evidence to support this, and either Lady Franklin was mistaken, or I believe the word is more likely sawyer. SRNSW: CGS 907, [2/7844], Joseph Douglass of 27 August 1839; reel 1120. The sale was advertised in the Sydney papers, with increasing hyperbole, at least weekly for two months prior to auction. The village of Enfield (now North Richmond) was similarly auctioned on 23 September 1841. See Appendix 2. The Sydney Morning Herald Monday 18 November 1844 p.3. NSW Department of Lands: General Register of Deeds. Book 14 no 274 of 1 January 1848. The Sydney Morning Herald Friday 4 July 1851 p.3. Death certificate 57/4370. John Douglass was in charge of the body, burial witnesses were Cuthbert Cowling and Timothy Corlis. Town and Country Journal, 3 Jun 1871 p.682. 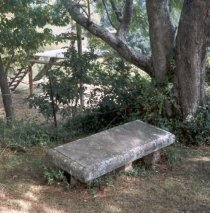 According to Vivienne Webb's Kurrajong: an early history (Sydney 1980) p84, the first graveyard was opposite Ivy Lodge, possibly on Joseph's allotments there. SRNSW: Supreme Court (Equity Jurisdiction); CGS 13504, Case papers 1822-c.1910; [3/3764], Case no 1834. Walker papers, Mitchell library MLMSS 7038/1/1. NSW Department of Lands: General Register of Deeds. Book 83 no 932 of 15 May 1863. Ibid. Book 82 no 573 of 13 Feb 1863. Webb, Vivienne. Op cit. p.83. Will Douglass to Henry Selkirk, 1926. Op cit. Also in "A Trip to the Kurrajong", The Sydney Morning Herald 26 Nov 1868, "Somerset" mentions "the admirably managed hospice ... Mr Onus's (more commonly known as "Douglas's")". 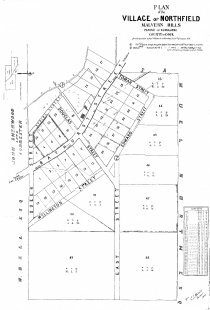 NSW Department of Lands: General Register of Deeds. Book 2829 no 528 of 29 Mar 1967. Boughton, Samuel. "Reminiscences of Richmond, from the Forties down" no 57. The Hawkesbury Herald Friday 29 April 1904 p.16. Greville's Official Post Office Directory 1875-77. Op cit. At Kurrajong Heights are listed Cameron, Dr Andrew, Douglass cottage; and Cameron, Rev James, Douglass house. National Archives of Australia: SP32/1, Kurrajong Heights Post Office file, 1875-1914. I am indebted to Bev Woodman of Newcastle for this reference.